Twiddle plays to a large crowd in San Francisco, CA. Photo via Twiddle’s Facebook. For those who aren’t familiar, Twiddle is a nationally touring American rock band that formed in 2004 when keyboardist and vocalist Ryan Dempsey and lead singer Mihali Savoulidis met as students at Castleton University. The jam band uses instrumental improvisation and incorporates inspiration from different music genres into their live music to create a truly unique live musical performance. Percussionist Brook Jordan and Bassist Zdenek Gubb will return with Dempsey and Savoulidis to the community as a “coming home” event to where it all began. The two day event, presented by GoodWorks Entertainment, will benefit an upcoming scholarship at Castleton University through the White Light Foundation. “We all understand what it’s like to struggle financially, so when the idea to create a scholarship at Castleton came up, we all got on board immediately. We’re honored the band and The White Light Foundation are able to give back this way,” Savoulidis said. The White Light Foundation is a volunteer-based non-profit organization that formed in part by Twiddle fans in 2015 with a mission to spread love, healing and kindness and give back to many of the communities where the band is playing. Last year the foundation donated 70,000 dollars across 50 different areas across country. “Castleton is where the band started and it’s pretty great to be able to be a part of the band’s coming home,” said Steve Perlah, President and Ceo of the non-profit . According to Perlah, the foundation has set a goal to raise $20,000 for the scholarship for Castleton University. They are leaning towards scholarships to be given out annually with three goals in mind; helping students get involved in their community, helping students in need, and giving back the music department. Jeff Weld, Dean of Advancement at Castleton University, said the concert will open doors for events like this in the future. He enjoys seeing the former Castleton students succeed as part of the nationally touring band. “Any time you can watch students develop at Castleton and then go out and achieve success and do things on a bigger stage, it’s fulfilling - no matter what field they’re in. Twiddle’s got a great sound and it’s been really neat to see their following grow. They tour like crazy flying all over the place and then, ‘Bam!’ They’re here in Rutland,” Weld said. Castleton students purchased tickets at a discounted rate through the University before the event sold out to give students a chance to enjoy the performance on a limited budget. Twiddle’s great sound and unique quality to their music makes them popular nationwide, but their desire to give back makes them an even more likable band and distinguishes them from the rest. For more information on the band visit http://twiddlemusic.com, or to learn about the White Light Foundation sponsoring the scholarship visit https://whitelightfoundation.org. Listen to Twiddle’s music available on Apple Music and Spotify. Didn’t get tickets before the dates sold out? “Twiddle” will return to Vermont for the fourth annual Tumble Down Music Festival on the Burlington Waterfront in July. Twiddle plays the Troubadour in West Hollywood, CA. Photo via Twiddle’s Facebook. 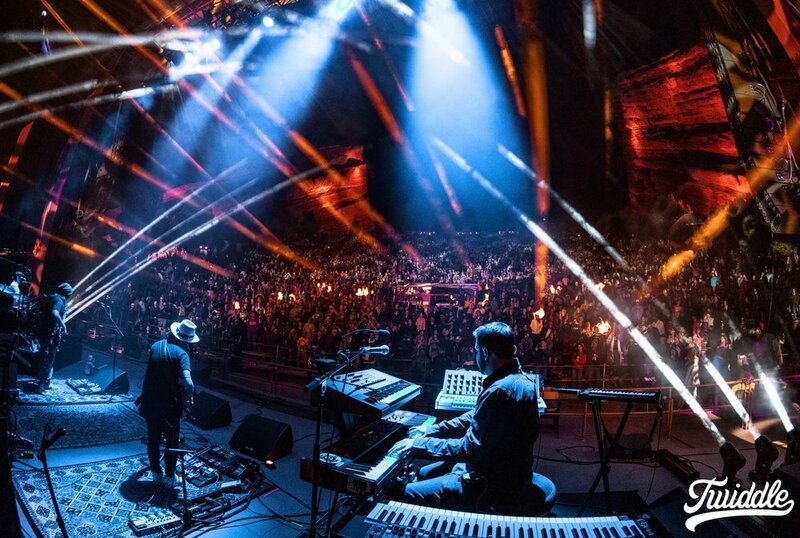 Twiddle plays Red Rocks in Morrison, CO. Photo via Twiddle’s Facebook.